FunAwards.com is well known for its collection of "Funny Office Awards". A few years ago, someone asked me if my "Funny Employee Awards" would work for companies not in an office environment. We don't want to leave out nurses, firefighters, restaurant staff, and all of the blue-collar folks out there working outside of an office environment. The short answer is, yes - Funny Employee Awards does have a large selection of funny work awards for non-office personnel. But truthfully, I did have office workers in mind when I wrote the first collection of awards a few years back. Since then, I have released "Funny Teacher Awards" and more recently "Funny Award Certificates". 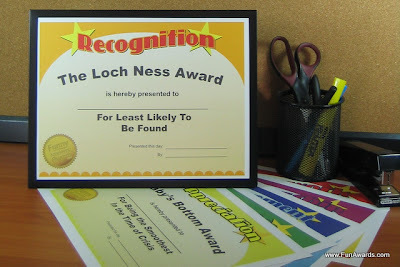 I wrote Funny Awards Certificates as a more informal version of Funny Employee Awards. In an office environment or employee awards setting, managers and bosses must be mindful when poking fun. In a warehouse or blue-collar setting, coworkers might be more apt to let loose and really have fun with their fellow workers. 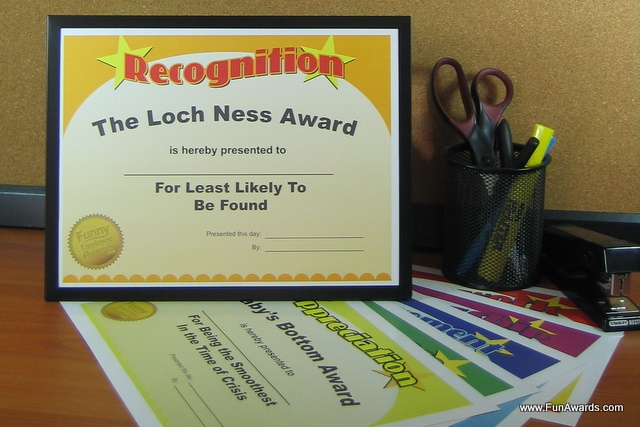 Funny Employee Awards purposely avoids potentially embarrassing personality traits or appearances. Funny Awards Certificates pushes the envelope a little further for workers who are more tight-knit and not afraid to have a little fun. Or buy them both and you'll have funny work awards for everyone!